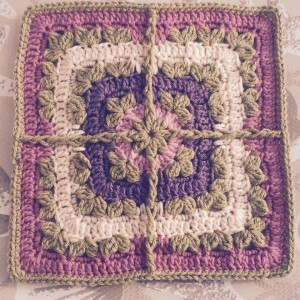 This week our two blocks are similar in that they both feature cluster stitches. 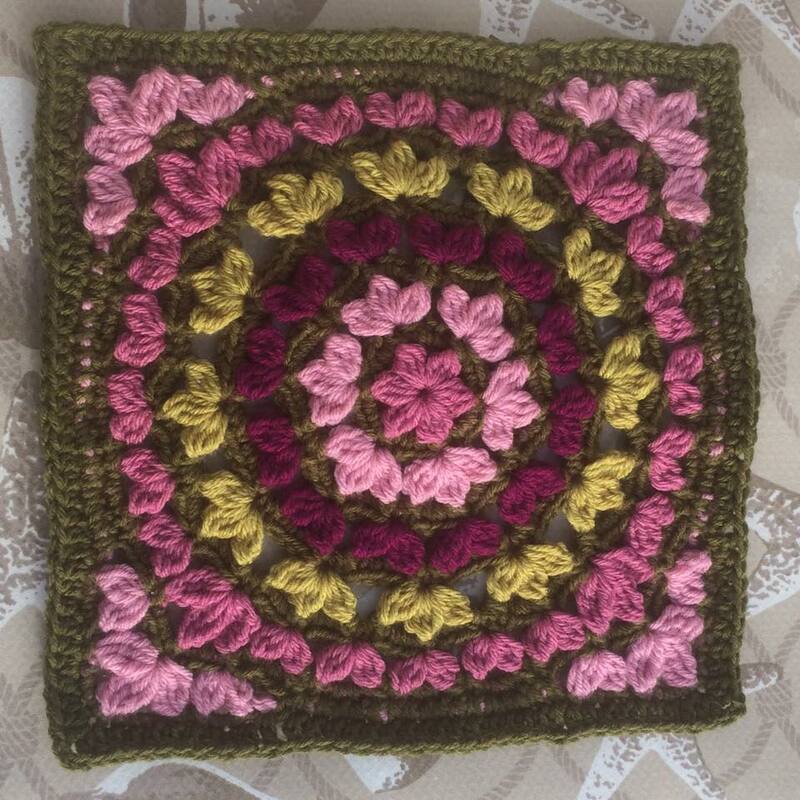 Floral Fantasy is our paid pattern and is available on Ravelry both as a single pattern at $3.99 and also in our CAL E-book with 17 other patterns for $15.00, or in my E-book #3 with 10 other blocks for $11.99. 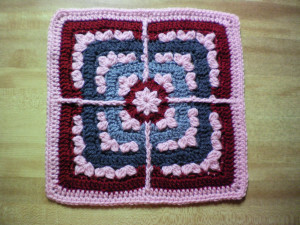 As with our other blocks in this project, change colors as desired to form your own unique afghan. If you want to do a “stashbuster,” I think it looks nice to include a little bit of one color in every block to unify things. I just went back and reworked Floral Fantasy and it is great fun. 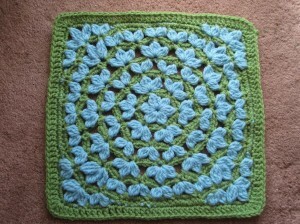 I like an easy repetitive pattern. 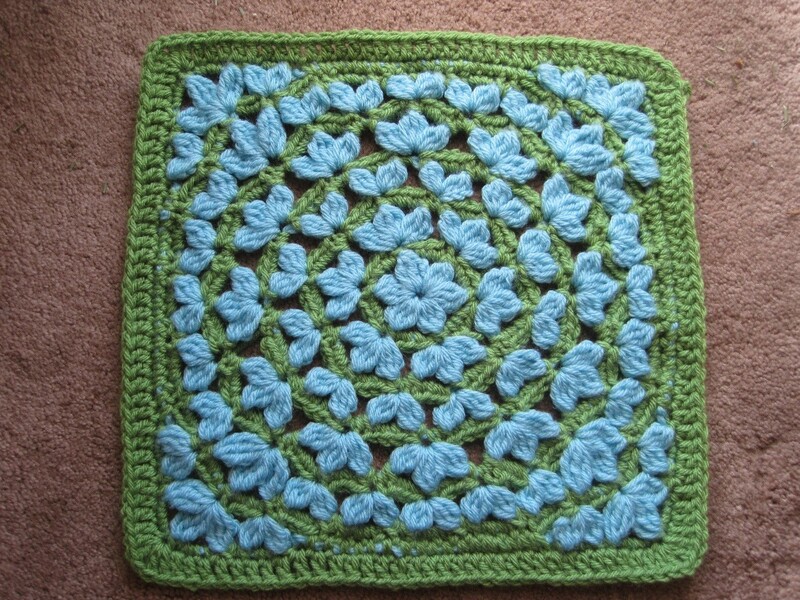 🙂 I used an I hook but I am a loose crocheter, and I came in at a little over 12”, so I am going to give a gauge measurement after a few rounds. After 4 rounds I was at 5”, so if you are larger than that you need to start again with a smaller hook. Right before the last round mine seemed a little bulgy so for the last round I was thinking of doing something like corner, dc in next 10, hdc in next 13, dc in next 10, but it is also fine as written and a little blocking. You may also have to do sc or hdc on the last round to get your size. I ended up doing a round of hdc all around. I also put 2 ch in the corners because I am getting into that habit lately. Another tip is that for the beginning Cluster I have been doing ch-2 lately instead of ch-3. 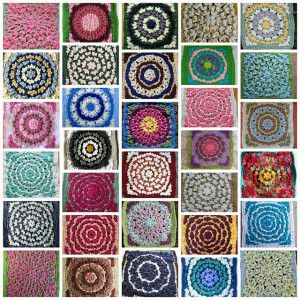 I think I’d like to make a hat with this pattern. 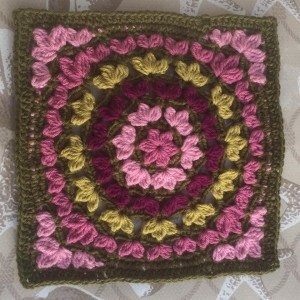 The second block this week, Clusters Afghan Square, is offered free with a coupon code – the code is CC. (Coupon good until February 29, 2016.) 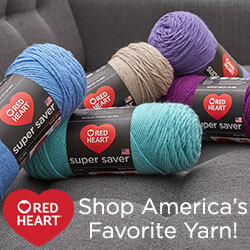 Go to the pattern page on Ravelry, hit “buy this now,” or “add to cart” and a shopping cart will come up. There will be an area to enter your coupon code, then hit apply. The price will come down to zero. Please do not share this coupon code, but direct people to this blog to pick up their code. 🙂 Here is BankerLady’s version which is much prettier than mine. 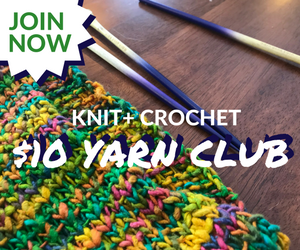 With Crochet Clusters – now called Clusters because I was not compliant with the Ravelry Database rules, make sure to keep your post stitches loose. 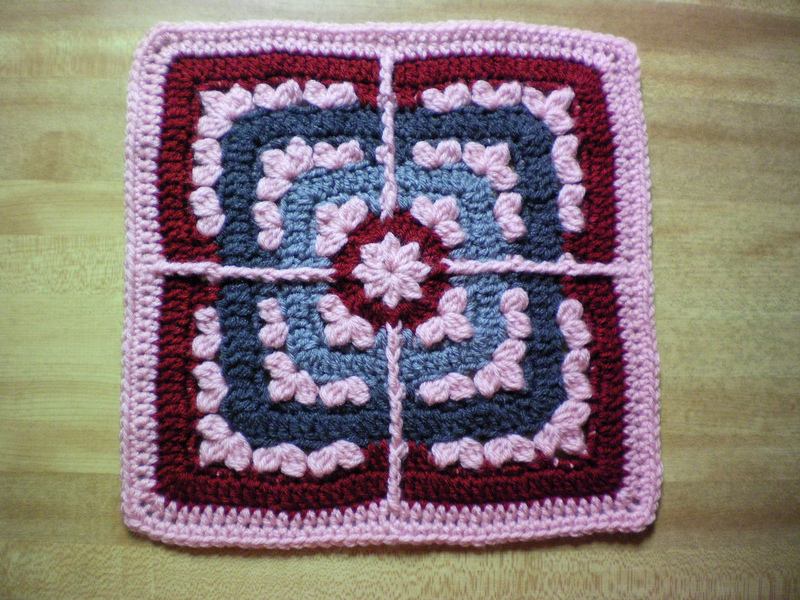 Add another “yarnover” if necessary but you don’t want the sides pulling in. At one point I said put spike stitch on either side of the fpdc but it should be fptr. Another tip for both blocks is that with FF you could avoid fastening off Color B and carry it up the back and with CC do the same with Color A. I would chain 3 or 4 and carry it up. It’s noticeable on the back but makes much fewer ends to weave in. Another tip: Working with your chosen palette, it is up to you to change colors in each block as desired. 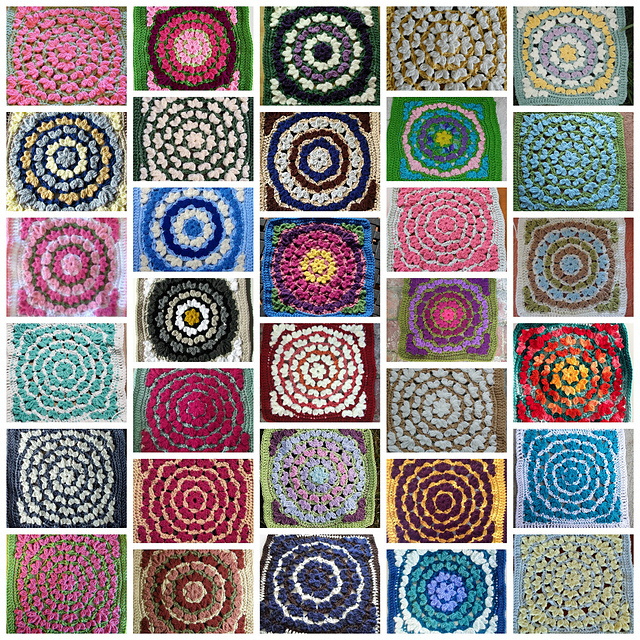 You can look at the Ravelry project pages for ideas on how others changed colors, for example:http://www.ravelry.com/…/libr…/clusters-afghan-square/people. 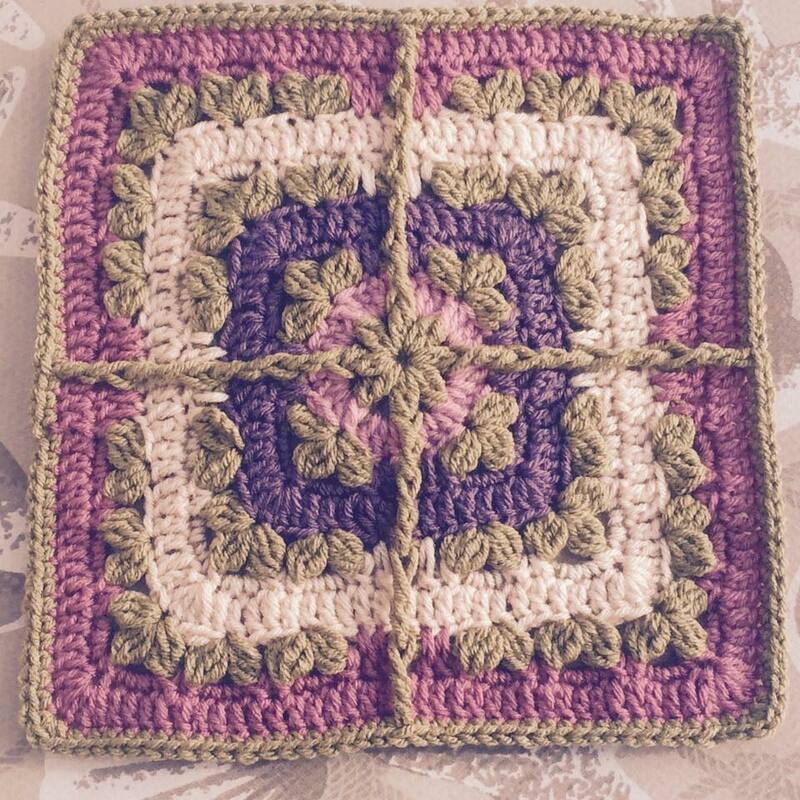 If you have any problems with this week’s blocks, please ask questions on my Ravelry board or my Facebook CAL page (type Crochet-A-Long with JulieAnny in the Facebook search box to find and join group) and I or some of our friendly group members will be happy to help. We will discuss joining and bordering as the CAL moves on. Please note that the add to cart option is the only way the box to enter the coupon code will pop up. It is definitely valid; many people have used it. Please try again, and try “Add to Cart” if “Buy it Now” does not work.